KAZAN, Russia (AP) Colombia coach Jose Pekerman gave his wish list for the team’s next match against Poland, most importantly keeping all 11 players on the pitch. In a disappointing 2-1 loss to Japan in Colombia’s first match, the South Americans were reduced to 10 men and a goal behind in the opening minutes. 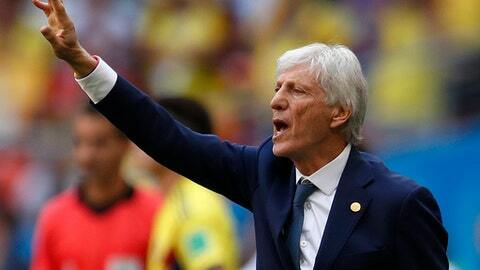 Pekerman has noticed that it has been very difficult to overturn deficits at this year’s tournament. Switzerland’s 2-1 victory over Serbia on Friday was the first game to see a side come from behind to win. While all coaches want to see their team score first, Pekerman’s desire takes on special significance since only one team has done it so far. ”When there are teams ahead with an advantage, it’s not easy in the World Cup to turn things around,” Pekerman told reporters Saturday on the eve of the Group H match at Kazan Arena. Both Poland and Colombia have lost their opening match, to Senegal and Japan respectively, and could be eliminated with a loss. Japan and Senegal are up against each other in the pool’s other match Sunday. Pekerman was bombarded with questions about his lineup and hinted that playmaker James Rodriguez could be given a starting role. Rodriguez, the top scorer at the 2014 World Cup in Colombia’s surprising run to the quarterfinals, was used as a second-half substitute during the loss to Japan after being hampered by a calf injury. ”No. 1 thing, football is 11 against 11, this is our priority, this is how football works” Pekerman said.